QASymphony / Blog / Exploratory Testing Tools: qTest eXplorer or HP Sprinter? Exploratory Testing Tools: qTest eXplorer or HP Sprinter? The adoption of exploratory testing continues to rise in both small and large software testing teams. Exploratory testing has been labeled critical for companies looking to adopt DevOps for their software release strategy. Gartner predicts that DevOps will become a mainstream strategy in 25 percent of Global 2000 organizations this year. At QASymphony, we are no stranger to talking about the benefits of exploratory testing; we see it as essential to the software testing release pipeline. qTest eXplorer saves testing teams time by automatically capturing activities from exploratory sessions. The coolest part about qTest eXplorer is the native integrations with JIRA, Rally and VersionOne – it’s easy to use, light weight and plays nice with agile platforms while consolidating all gathered data through a session manager. That’s a big deal! 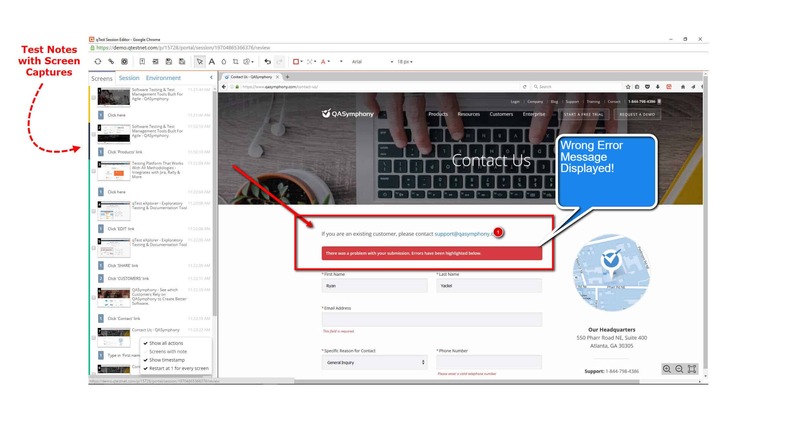 Not to mention, qTest eXplorer automatically records all test execution environment data and user interactions on desktop, web or mobile apps. For those that have an HPALM license, HP Sprinter may help with performing exploratory testing. However, I have put together a few thoughts around some items you might want to consider when comparing qTest eXplorer with HP Sprinter. Of course I work for QASymphony so one might say I have a bias opinion, however it is rare that I find someone to disagree. qTest eXplorer was created to capture all test session information without disrupting the tester. It has a simple, unobtrusive UI widget (see below image) that hides while you test, but can instantly be brought into focus for session notes. This allows the tester to focus on testing rather than the documentation of the tests. 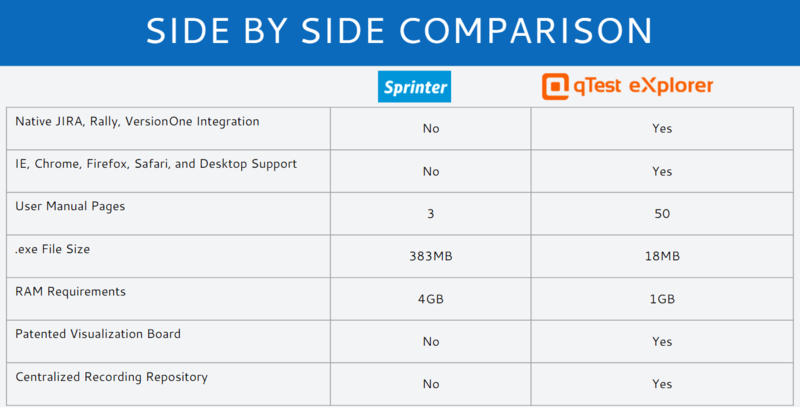 HP Sprinter was built with HPALM integrations in mind rather than external integrations like JIRA (not to mention you are required to have an HP license to use Sprinter). It is great that testers can use data injection to integrate their Sprinter sessions with UFT; however, Sprinter’s UI appears clunky and distracting from the actual testing that is occurring (see below image). If testers leverage open source automation tools like Selenium, rather than HP UFT, then some Sprinter features won’t be necessary. Sprinter’s crowded UI, could also obscure areas of opportunity during test by covering new UI elements on your application. Session based testing remains the most structured way to do exploratory testing, because it facilitates a way to track important data that can the be shared later. qTest eXplorer allows testers and managers to organize and centralize test sessions through our Session Manager. From the Session Manager, testers can see all the data elements listed below that make up what a session report should include. 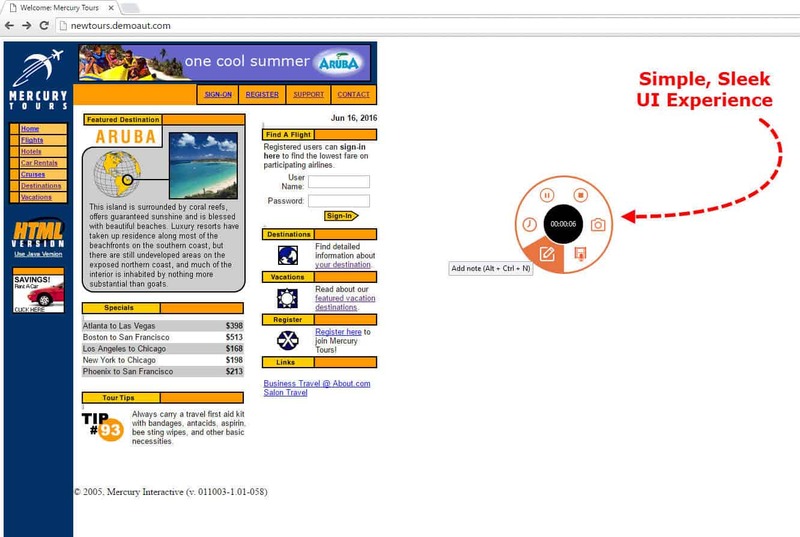 This allows teams to collaborate around a web portal rather than passing around internal documents. 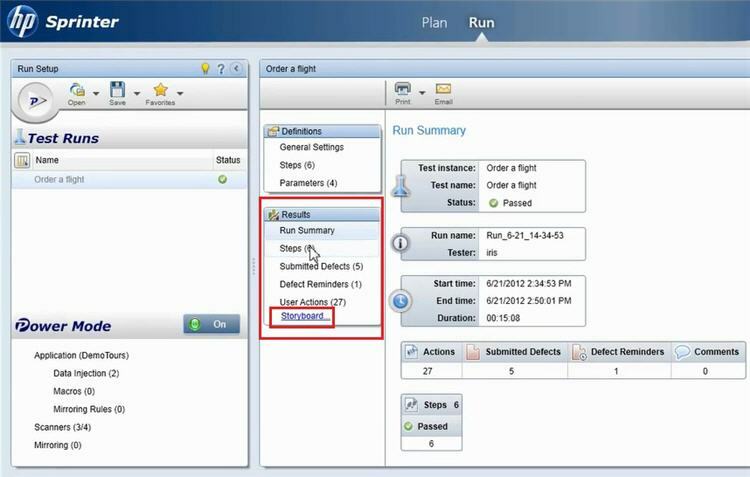 In the images below, we will show you how the Session Manger can accommodate session based testing. With Sprinter, software testers can automatically capture their recordings, but debriefing an entire team can prove to be troublesome due to not having a dedicated manager for review. 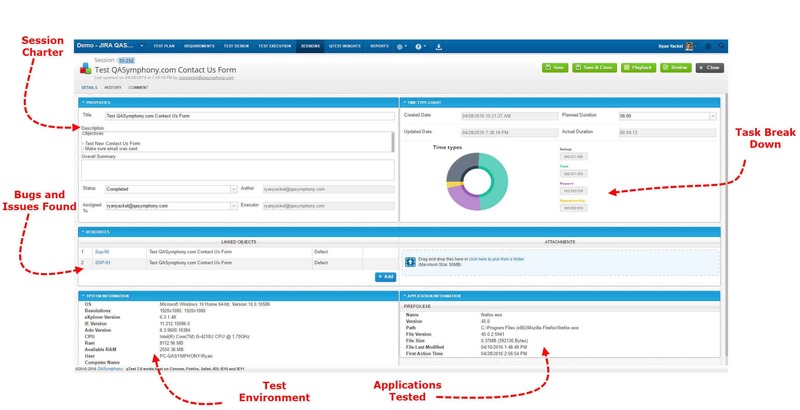 Testers can created test cases (a feature qTest eXplorer also provides) but submission of results would have to be reported back into HP’s platform. 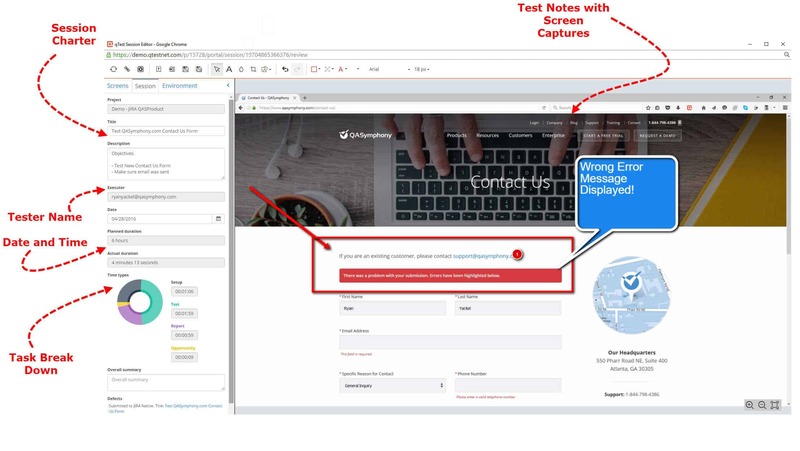 Storyboard is also an option to use, but it might be tied directly to the testers machine rather than a easy to access portal for reviewing. Simple deployment, and simple integrations. While you have to own a HPALM license to use Sprinter, you have the option to use qTest eXplorer as a standalone product or integrate it with the entire qTest Platform. Check out the below video to see qTest eXplorer in action. qTest eXplorer integrates naively with the most popular agile platforms like JIRA, VersionOne, and Rally. The eXplorer .exe download is less than 18MB (about the size of the HP sprinter user guide), the HP Sprinter .exe download is 383MB which took me personally more than 15 minutes to download. In my opinion, if eXplorer and Sprinter are both meant to drive efficiency and standardization – how can you do that when your initial set up and training cost is several hours? Additionally the difficulty could keep the majority of your team from adopting the tools. Interested in checking out qTest? I recommend signing up for the free 14-Day trial.